The serenity we feel on beautifully isolated Lake Powell is one of the main reasons we have returned again and again to revel in its majesty. The 186-mile-long lake with over 1,900 miles of shoreline and 96 canyons has awed my wife, Jan, and me since we first visited 15 years ago. Ever-changing scenes range from daytime reflections of colorful, sun-drenched cliffs to starry night skies with moon glow above calm waters. 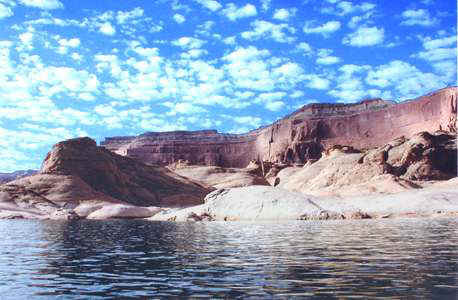 Lake Powell sits at the center of Utah's Glen Canyon National Recreation Area, running northeast from the Arizona border. It is one of natures most inspiring settings, made accessible by the engineering feat of the Glen Canyon Dam on the Colorado River. Whether water sports enthusiast, fisherman, photographer or sightseer, the lake keeps one breathless: clear blue/green waters; red, black and tan cliffs; magnificent rock formations and arches; and traces of early Native Americans. Boating on Lake Powell is perhaps the most spectacular way to capture Glen Canyons incredible Southwest beauty. This past summer we again succumbed to the lakes pleasures with our annual weeklong vacation via houseboat. Our trip started near the dam from where we explored upriver along two major tributaries. We departed with three couples from Wahweap Marina in a luxurious 59-foot Admiral houseboat rental. The four staterooms, two bathrooms, fully equipped kitchen, and large covered upper deck provided a very comfortable touring platform. We towed a rented 19-foot runabout for additional water sporting and exploration opportunities. Experience had taught us to request pre-boarding, so we were able to board our boat late in the afternoon prior to our day of debarkation. The benefit was that we were able to get our boat ready and take a quick run across Wahweap Bay to a Warm Creek Bay campsite prior to dark. Under the stars and moonlit shadows of Castle Rock, we relaxed with beverages of choice and dined on our only pre-purchased fast-food meal of the week. Our group didnt fight for staterooms, as sleeping under the stars on the upper deck is always spectacular. The morning sunrise was our alarm clock and got us on our way for our 64-mile journey up the lake to Llewellyn Gulch, our canyon of choice for the next three nights. Motoring along at 10 to 12 miles per hour, we crossed Warm Creek Bay and motored up the channel past Padre Bay where Gunsight Rocks provided one of our many photo moments. Dangling Rope, approximately 40 miles up the lake, was our first stop of the day. Here we gassed up the boats, packed some more ice, and treated ourselves to some ice cream. 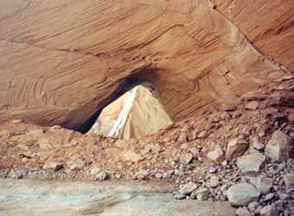 We lunched as we motored from Dangling Rope to the entrance of Forbidding Canyon. The magnificent cruise through the deep canyon is climaxed with a spectacular view of Rainbow Natural Bridge. Its the largest span of its kind in the world, and, depending on your reference encyclopedia, noted as "one of the seven natural wonders of the world." Although not our first sighting, we were again left almost speechless by the majestic arch. 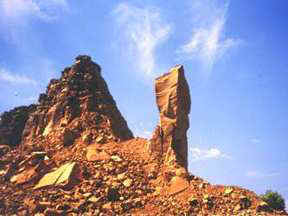 Non-Native Americans first viewed the site on August 14, 1909 when a Piute Indian, Nasja Begay, guided a group of 14 horsemen headed by Cummings, Wetherill and Douglas. Rainbow Bridge towers 290 feet high with a 275-foot-wide base. The arch has a 42-foot thickness at its vertex. 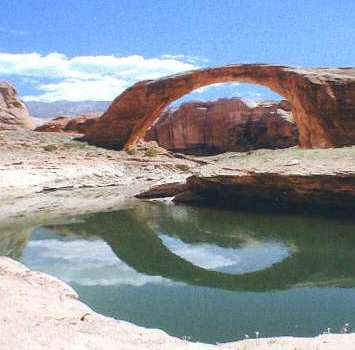 Thousands of people visit the bridge each year, most by boat, but some by foot on a 16-mile trail from Navajo Route 16. Later that afternoon we arrived at the small canyon of Llewellyn Gulch, near the junction of the Escalante River and San Juan Arm. Here we found a beautiful anchorage to launch our next three days of activities. With its high walls, the canyon was the perfect spot to enjoy quiet "all swim" moments and to dine in moonlit shadows. 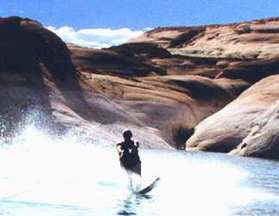 The convenient location also accommodated day excursions by run-about for canyon sightseeing, tubing, and water skiing. On successive days we toured far up the Escalante River and San Juan Arm with breathtaking canyons where our runabout almost scraped the walls at the narrowest points. On the Escalante River at Davis Gulch we viewed the splendid formation, La Gorce Arch, before continuing up to Three Roof Indian Ruins. Explorations up the San Juan Arm rewarded us with sights of outstanding rock towers, as well as the petroglyphs of Cha Canyon. For our final two nights on Lake Powell we cruised our houseboat back toward the dam and anchored in West Canyon, at the 26-mile point. This enabled a quick one-hour runabout trip to Wahweap to drop off one of the couples who had another obligation. They admitted to regrets on having to make the early departure. We remaining three couples tried hard to make up for their absence by imbibing in great quantities of food, beverage, and fun. Our West Canyon location also made for an easy last day cruise. Houseboats usually require a 2:00 p.m. check-in, so with a relaxing morning and a three-hour run, time was not an issue. Our run back this year gave us a very special treat. As we cruised past the entrance to Last Chance Bay at the 25-mile point, our cell phone delivered the announcement of our new Granddaughter, Lauren Anne Beresford, born August 31, 2001! 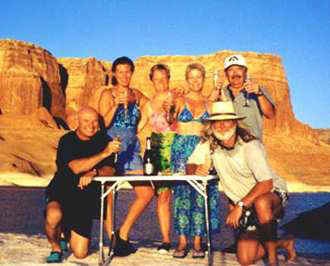 The joy of a Lake Powell houseboating adventure extends well beyond the 1,900 miles of shoreline. It includes the camaraderie experienced during the planning phase when boating choices, logistics, meals, and the itinerary are decided. Planning for this latest trip was a one-year project  a year of closeness in addition to our week together with inspiring scenery, exhilarating water sports, and happy memories. 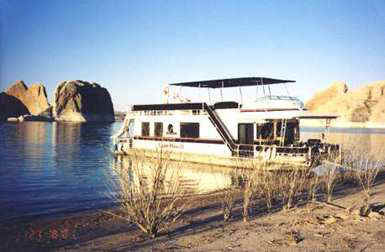 Is it any wonder that we are well along in our planning for next summers houseboat trip on Lake Powell? 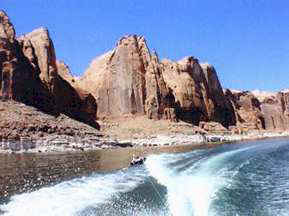 Click here for details to plan your own boating trip on Lake Powell.